On Sunday, Canada’s third major political party, the New Democrat Party (NDP) made history by electing its first non-White Jagmeet Singh its new leader. Canadian prime minister Justin Trudeau congratulated Singh on his victory with hope to work together for the good of Canadians. Singh’s victory is a great set-back to country’s Jewish lobby (CJPME) as he refuses to blindly support Israel’s policies. He also supports re-establishing diplomatic relations with Tehran terminated by Ottawa in 2012. 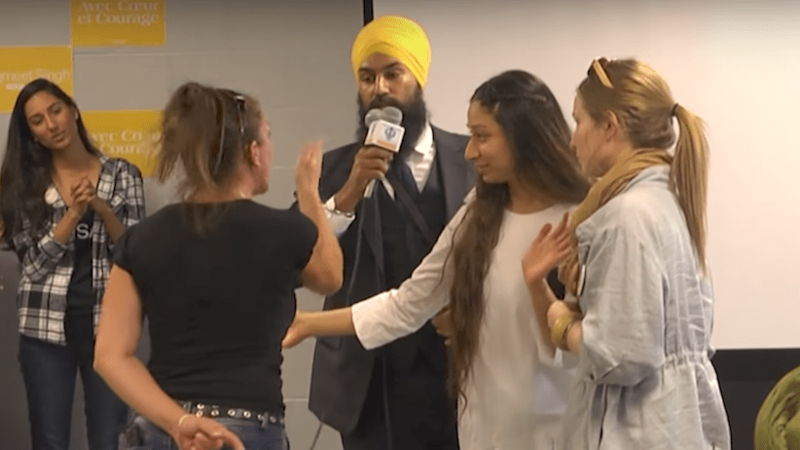 The only NDP Quebec MP to endorse Jagmeet Singh as next party leader, Hélène Laverdière, PhD, is blind supporter of Zionist entity. Jagmeet Singh, 38, former criminal defense lawyer and Brampton MPP to rose to prominence for his support for minority rights and country’s independent foreign policy in the Middle East will lead NDP into next federal election to be held in October 2019 against two pro-Israel parties; the ruling Liberal Party and the Conservative (Tory) Party. Turban-wearing Jagmeet Singh was born into an Indian Sikh immigrant family living in Scarborough, Toronto. He secured 53.8% votes against his three opponents. In December 2013, he was denied visa to visit India as result of his criticism of Indian prime minister Narendra Modi government’s anti-Muslim campaign. Jagmeet Singh voted in favor of anti-Islamophobia law in March 2017. He also supports BDS movement.